Plum Bar and Make Westing discover bar bites' higher calling. Plum Bar's "fried stuff" dish features pigs' ears, chicken skin, and more. Hours: Daily 4 p.m-2 a.m. The names of four newish Oakland bars are incanted with a certain reverence — Plum Bar, Make Westing, Dogwood, and Disco Volante — both for anchoring Uptown's makeover and for exerting a magnetic pull on cocktail sophisticates. Crowds are drawn by artful design, pretty faces, and drinks made with macerated rose petals and tamarind/black pepper mist. There are dining menus at each bar, but the nosh sometimes feels like just a convenient sop for top-shelf liquor. Express dining critic Matthew Stafford had mixed feelings about Disco Volante's food, while bar columnist Ellen Cushing loved the spot's decor, vibe, and cocktails. And though Dogwood has cobbled together a fine charcuterie and grilled cheese program, drinkers far outnumber eaters most nights. Honestly, food plays leading lady often enough; there's no shame in cocktails nabbing the breakout role. Yet at Make Westing and Plum Bar, keeping the spotlight off the menu may have been a stroke of luck. Allowing the chefs room to tinker, with less scrutiny from the dining public, has resulted in fare that's refined without being rigid, playful but not sloppy. At Make Westing, the big menu conceit is that half the offerings come in wee little jars. Post-Portlandia cynicism ("Put it in a jar!") initially made the whole thing tough to swallow. But though the presentation is a bit twee, executions are pitch-perfect. Rich, shareable oxtail bone marrow, pork rillettes, and olive oil-poached artichokes are glassed up and placed in woven wood baskets, with sides of house-pickled onions, coarse-ground mustard, and a parcel of parchment-wrapped Semifreddi's bread. It's precious. Goddamn if the sturgeon confit jar, oil-rich and flaky with notes of lemon peel, leeks, and bacon fat, didn't sink its hooks. After using a tiny fork to feather bits of fish onto the warm bread, given tang with onions and mustard, the last of my cynical flotsam drifted away. Faux "rillettes" in a jar, a mash-up of wilted arugula and a heady three-cheese blend, was like a garlicky spinach dip with cream cheese texture. Chef Melinda Vaca initially thought these jars would be the extent of the menu, no-prep fare for the bartenders to serve. But the draw of running her own kitchen, modest though it is — a convection oven and burners in a micro-space behind the bar — proved irresistible. After years working as sous chef at Sea Salt (also the proving ground for Caroline Pagel, Make Westing's cocktail creator), Vaca heeded the call of her own creative impulses. It's nothing lofty, a handful of fancy ciabatta roll sandwiches, a cheese plate, and some hot pepper/Cotija popcorn, but it offers a glimpse of Vaca's potential. The wild mushroom banh mi knitted together a smooth maitake and chanterelle pâté, jalapeno and carrot shavings, sweet and sour kohlrabi, and a slather of maple sugar aioli. Another sandwich paired shreds of confit duck with a tart pickled-grape jelly, given depth with arugula and black pepper-allspice aioli. Still another was built with fat-rich braised oxtail, threaded with bourbon-infused caramelized onions and finished with a spicy horseradish aoli. Sandwich mechanics were big and messy, but finely attuned to the subtle interplay of sweet, sour, and umami. There were little devils in the details — a couple of bone pieces in the duck, ineffective plastic knives to divide huge sandwiches, etc. — but Vaca deserves a little leeway. Working out of a Lilliputian kitchen, she's often running quadruple duty as prep cook, chef, dishwasher, and server. If the finished product lacks a little polish, it's still marvelous food for a bar. By comparison, Plum Bar feels like a more fully realized affair, clean and efficient and self-assured. Designed as an appendage to Plum restaurant next door, PB is a small piece of the Daniel Patterson empire. While there's been lots of turnover recently (cocktail consultant Scott Beattie, bar manager Michael Lazar, head chef Charlie Parker), the only personnel issue I encountered was a sour bartender. Plum's current head chef, Ron Boyd, is having a bit of a romp with Plum Bar's food program. He designed the menu as a less finicky complement to its namesake next door, using Plum's leftover meat and produce to mimic "family meals" for kitchen staff. "This is the food we like to eat," Boyd said. You can start light, with well-dressed mixed greens, Asian pears, and toasted pistachios, or a sweet and creamy parsnip soup, rounded out with bits of apple, hazelnuts, and sage. Other starters, spicy chicken wings (cooked sous-vide!) and smoked fries, are harbingers of the heavy fare to come. 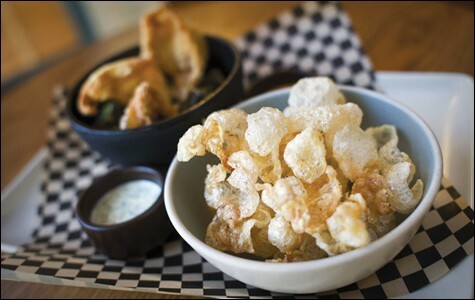 Plum Bar's "fried stuff" is a bowl of crispy flayed-out Brussels sprouts, smoky pigs' ears, and chicken skin, served next to a bucket of airy beef tendon chicharrón, with house-made hot sauce and buttermilk ranch. The stone-hard pigs' ears were difficult to eat in the same bites as the papery sprouts, but otherwise this dish was a brilliant riposte to the classic fried "wings and poppers" Americana platter. The poutine floats rich bits of braised pork shoulder and half-melted sharp cheddar in a sea of thyme-accented pork gravy, ladled onto smoky fries. It's a fairly traditional execution of the Canadian staple, ramped up with fine ingredients and careful prep. In a stew-like Mediterranean dish, rounds of lamb merguez were mixed with lentils and bread bits. With additional items like a smoked chicken skin flatbread and a massive double cheeseburger (with a concurrently huge $14 price tag), Plum Bar carves out its own identity from the produce-rich, lighter fare of its sibling next door. As at Make Westing, much of the food is indelicate and heavy. In this way, it succeeds in its basic utility — padding your stomach for a night on the town. Of course you could accomplish that at any number of downtown eateries, but Boyd and Vaca assume you want better. The latest in Daniel Patterson's empire survives the hype. Uptown's latest and greatest bar. The new restaurant's rich sights and sounds and late-night eats swoop into downtown Oakland. Cast of Bay Area dining luminaries hopes to establish new Oakland hotspot.